Kernel for Lotus Notes to Novell GroupWise is an ideal utility for system administrators and help desk staff to convert Lotus Notes mailboxes. It is a technically-sophisticated and self-explanatory tool meant for migrating Lotus Notes (NSF) files to Novell GroupWise mailbox. What’s more, it not only converts Notes to GroupWise but also makes sure that data reliability is maintained in the resultant file. Migrate orphan NSF file(s) to GroupWise mailbox: able to convert 'N' number of NSF files to GroupWise mailbox in a single cycle. This way you save a lot of time for performing other productive tasks in a workplace. Retrieves NSF file(s) from Domino Server to GroupWise mailbox: fetch NSF files directly from Domino Server and convert them into GroupWise mailbox. However, for this Domino Server must be in working state. Save migrated data both in text format and RTF format: useful options for saving converted emails in 2 different text formats and offers you the ability to make decision on whether or not you wish to preserve formatting of the emails. Filter email items saving to save them: if you don’t want to save all email items to GroupWise mailbox, just save selected objects such as emails, notes, tasks etc to GroupWise mailbox. This way you save a lot of time that could have been spent in searching required email item. Unite multiple NSF files into a single GroupWise mailbox: you can specify a new name for the group of NSF files that you are converting into GroupWise mailbox. After you specify the name for the group of NSF files, the software merges the emails in a single folder. Interactive and self-explanatory GUI: It has self-explanatory and simple GUI which makes the process of migrating emails, tasks, contacts etc from NSF to GroupWise performed with utmost easy and efficiency. Display Preview of converted/migrated data before saving: Using this feature, information like from, subject, date, size, etc. can be previewed along with attachments' existence and textual information embedded in email. 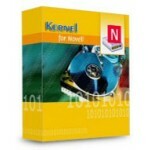 how to use Kernel for Lotus Notes to Novell GroupWise?